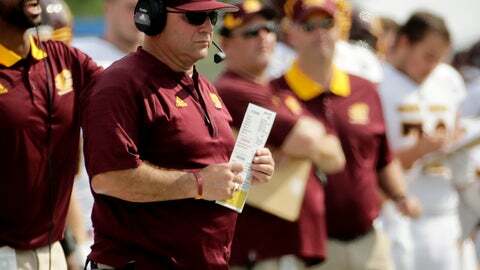 MOUNT PLEASANT, Mich. (AP) — John Bonamego is out as Central Michigan’s football coach after the Chippewas finished 1-11 this season. The school announced Friday night that Bonamego will not return, hours after CMU lost its season finale to 51-13 to Toledo . Bonamego coached CMU for four seasons and went 22-29, with a 15-17 mark in the Mid-American Conference. The school says DHR international will assist with the search for a replacement. Bonamego announced before his first season at CMU that he had cancer in his left tonsil. He was able to keep coaching and took the Chippewas to a bowl that year. Earlier this week, he said in a Twitter post that he’d been cancer free three years.